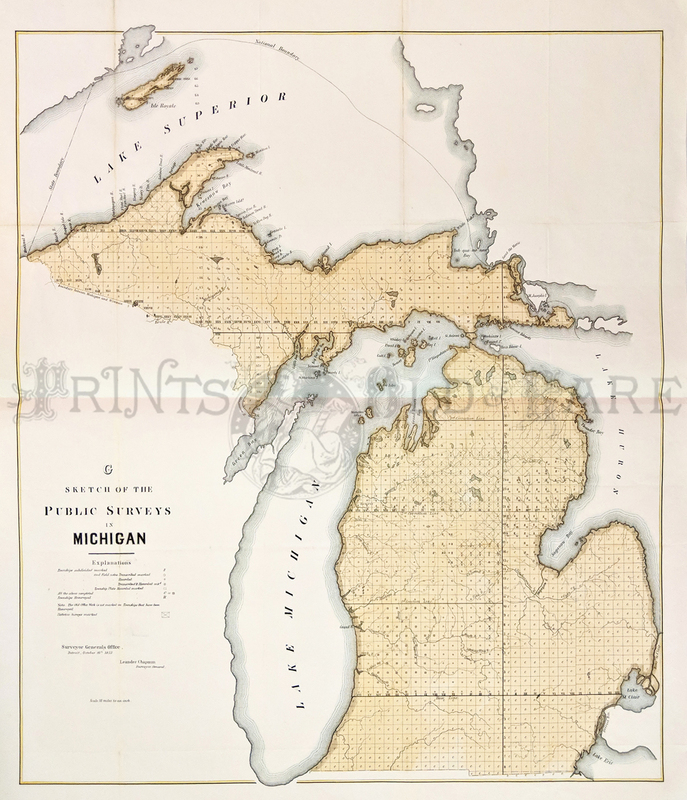 of Antique Michigan Prints and Maps. View of City of Detroit. Professionally hand-watercolored steel-plate engraving. One of the best views ever produced on Detroit and the River. 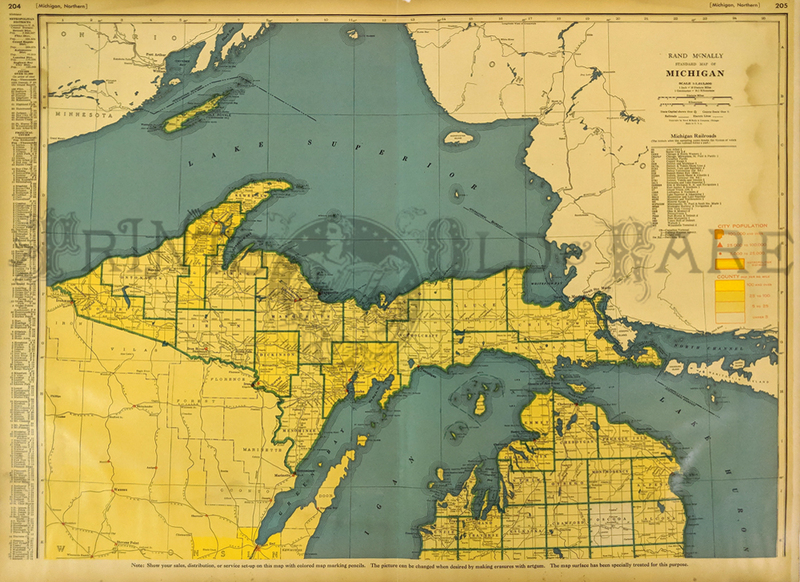 Lake Superior Summer 1885. 6 vignettes including Birdseye of Ashland, Bayfield, Indians Harvesting Wild rice, Lone Rock, Franciscan Works and Mad River. Hand colored, wood engraving by Charles Graham. View, Waterford, Oakland County, Michigan. 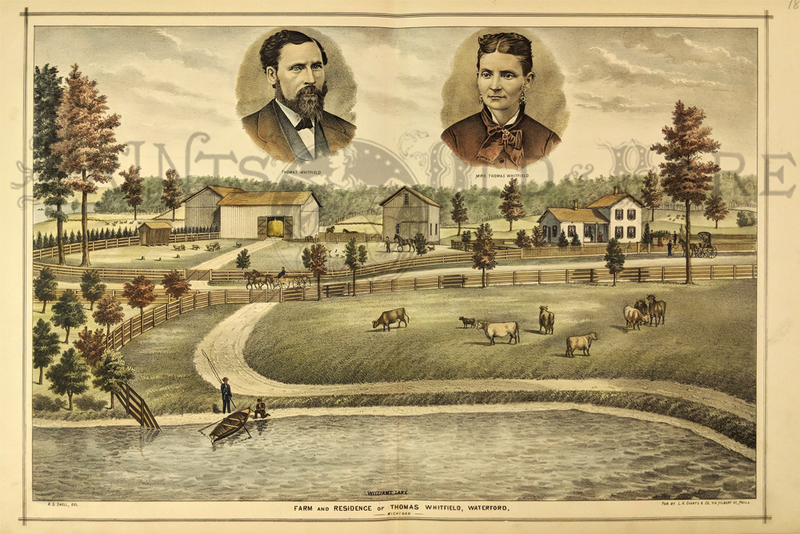 Handcolored lithographic view of Farm and Residence of Thomas Whitfield. 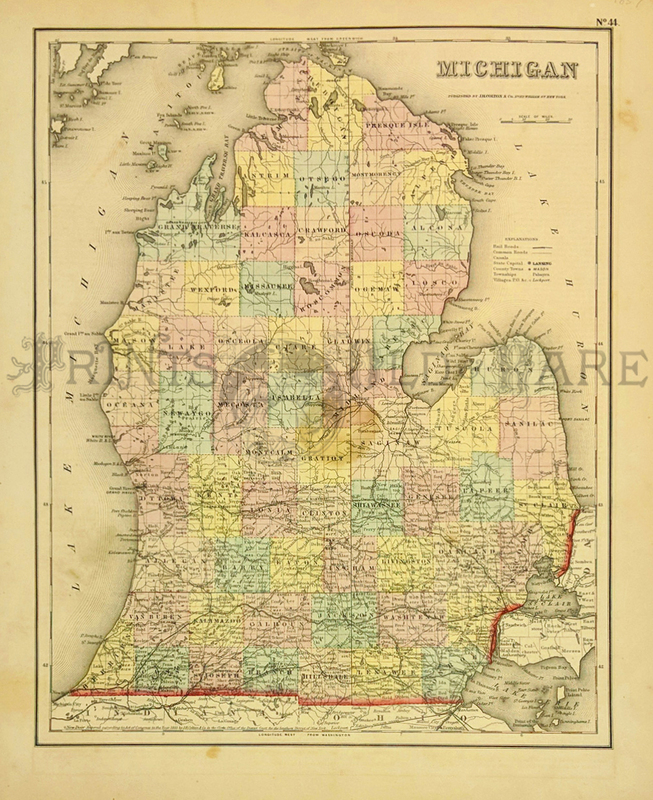 From Oakland County Atlas 1878. 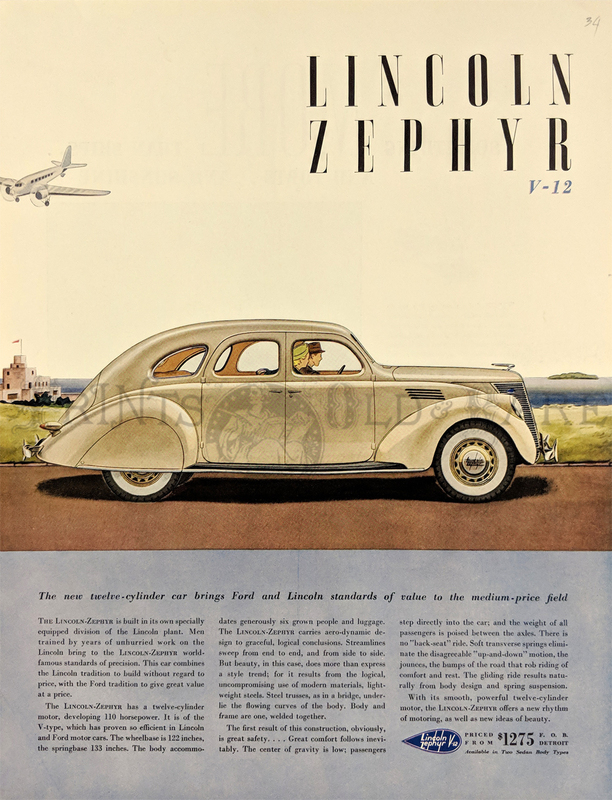 1934 Colored Lincoln Zephyr ad - Car sells for only $1275! FOB Detroit-. 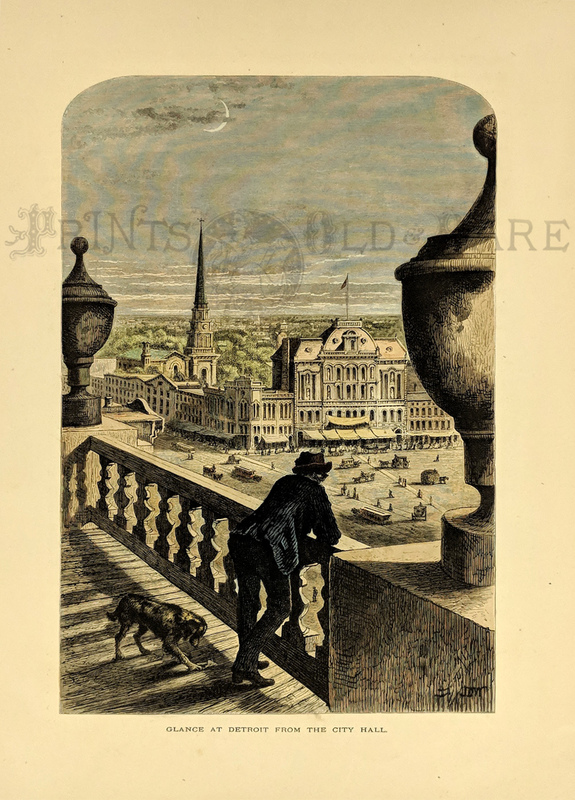 View of Detroit from City Hall 1873. Handcolored. Picturesque America. 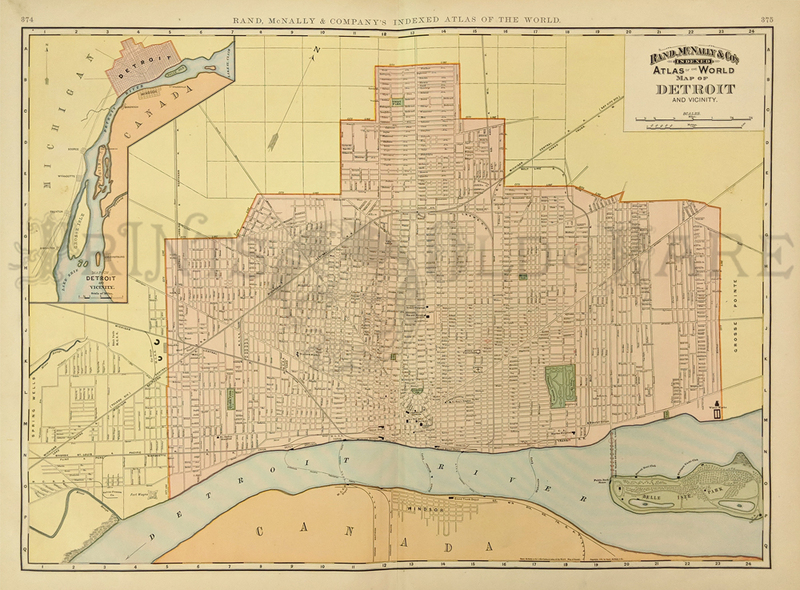 1897 Map of Detroit Michigan. 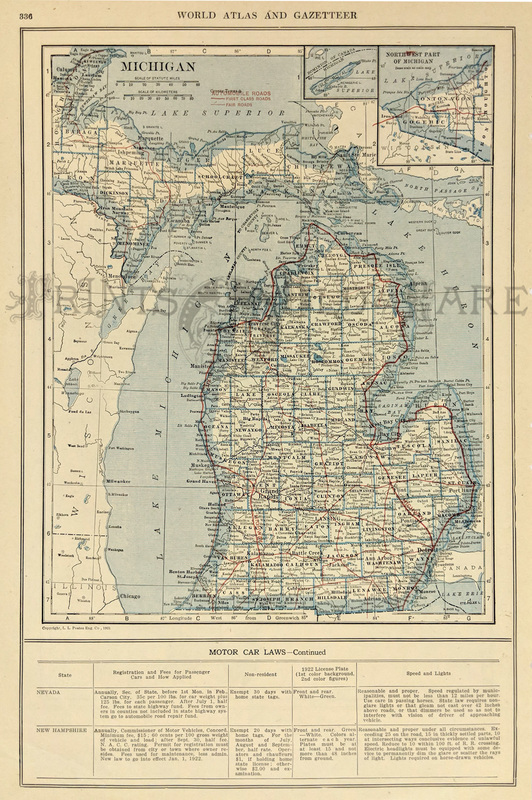 Interesting map of Detroit, from the 1897 edition of Rand McNally's Indexed Atlas of the World. 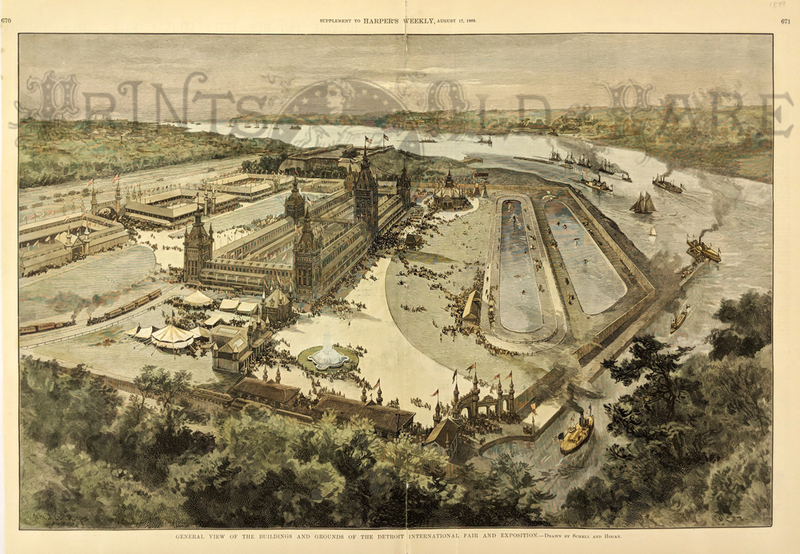 Streets, railroad lines, major buildings and parks are all shown. 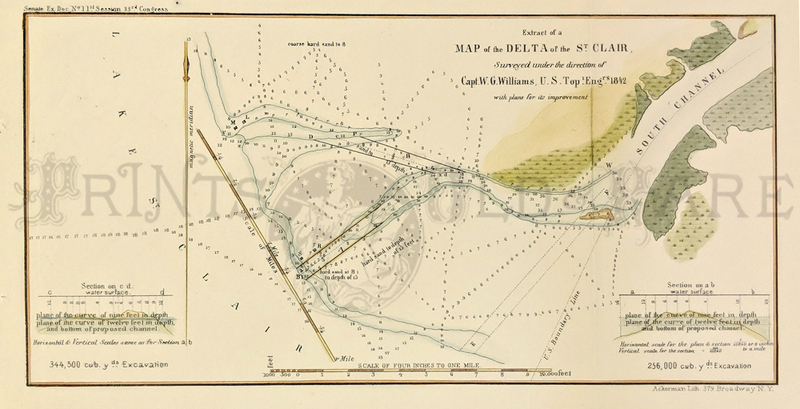 In the upper left corner, there is an inset map of Detroit and its vicinity. 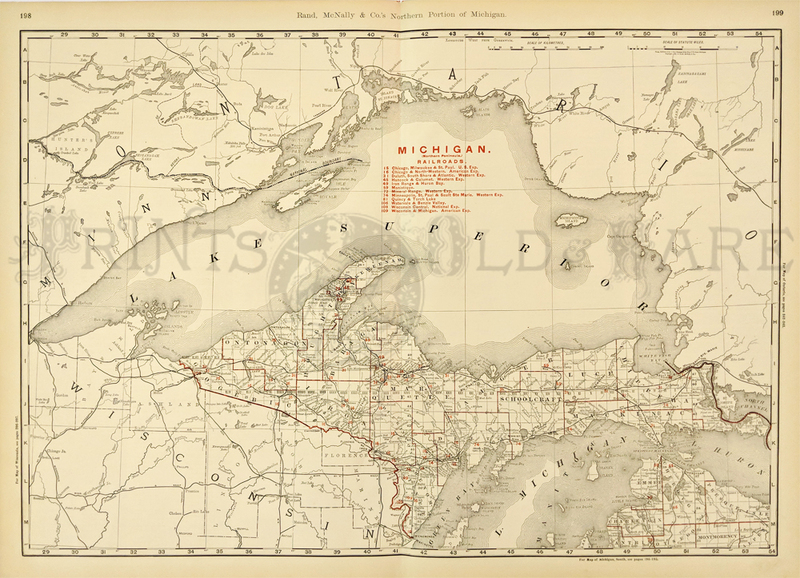 1889 From Owen Sound to Mackinac. 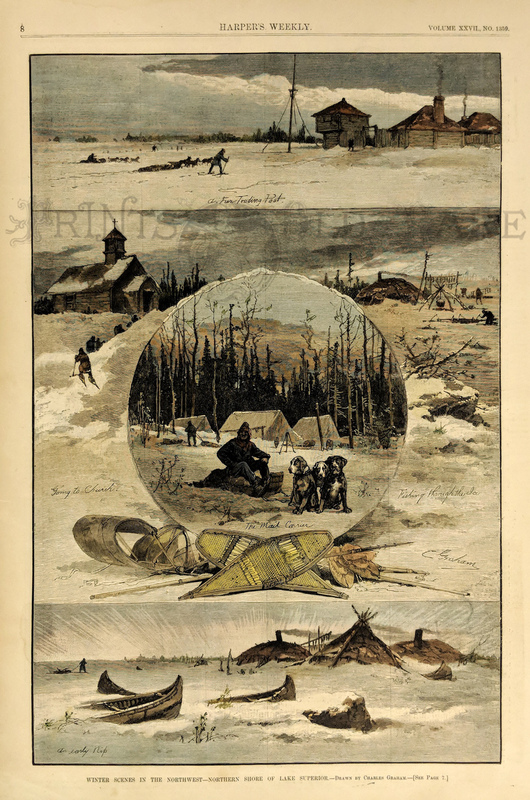 This rare handcolored, double page engraving shows 13 views of northern Michigan: Sault Ste. Marie Rapids from the old State lock of 55, Passing through the new U.S. 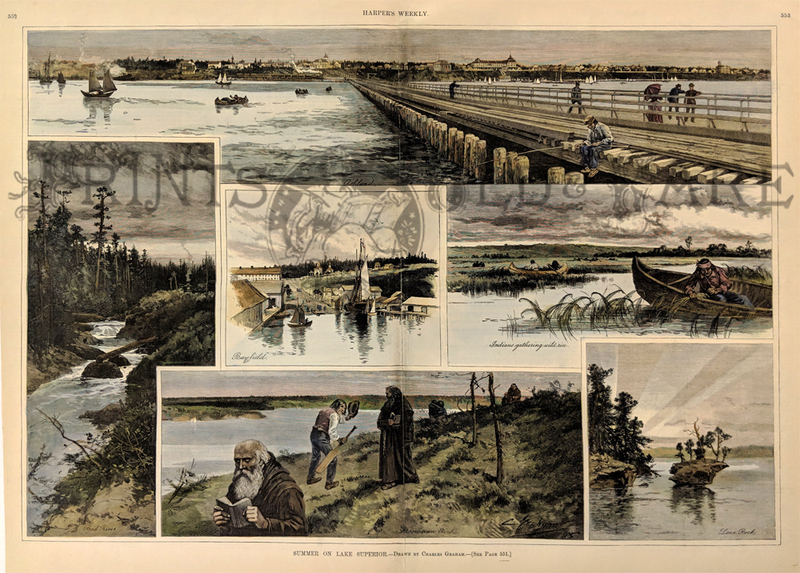 Lock, looking towards Superior from the west end of canl, Ruins of the Bruce copper mines-north shore of Huron, Arch Rock- Mackinac Island, distant view of Mackinac Island, Killarney, narrow channel near Spanish Rr., unwilling passengers (livestock), Little Current, Owen's Sound from the quarry, the arch from the lake, and a corner of the old fort- Mackinac Island. 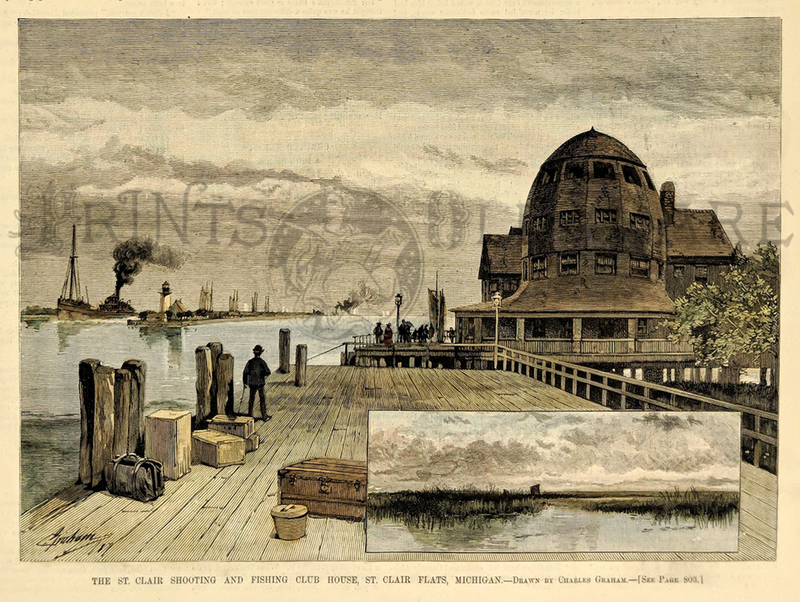 This genuine antique print is from the October, 1889 edition of Harper's Weekly. 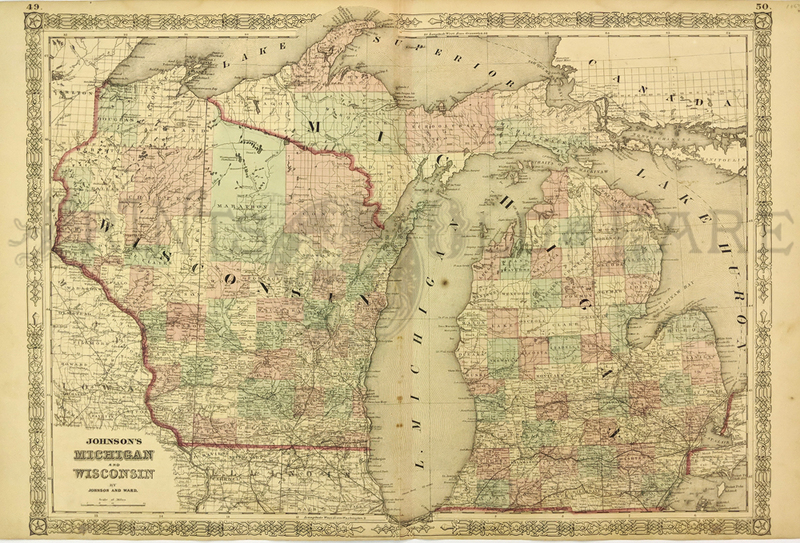 1844 Hand colored lithographed Sketch of the Public Surveys in the North Part of Michigan. 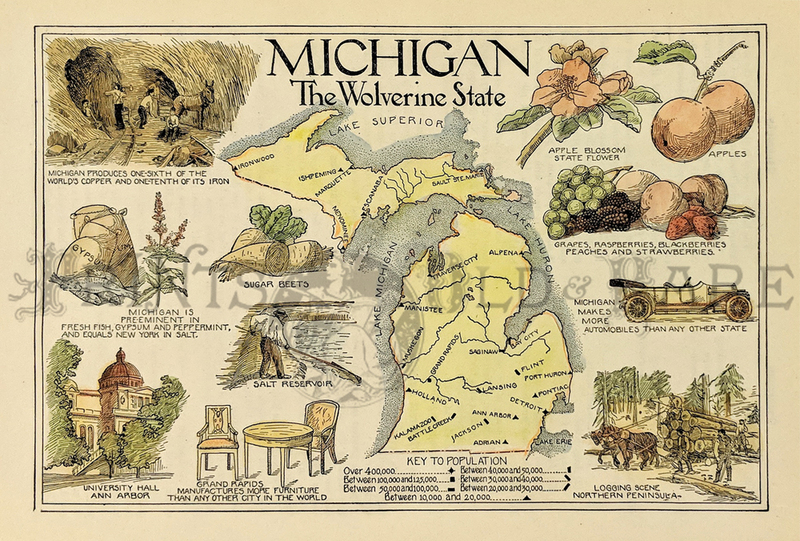 1915 Color images showing Michigan's resources titled, "Michigan, The Wolverine State. 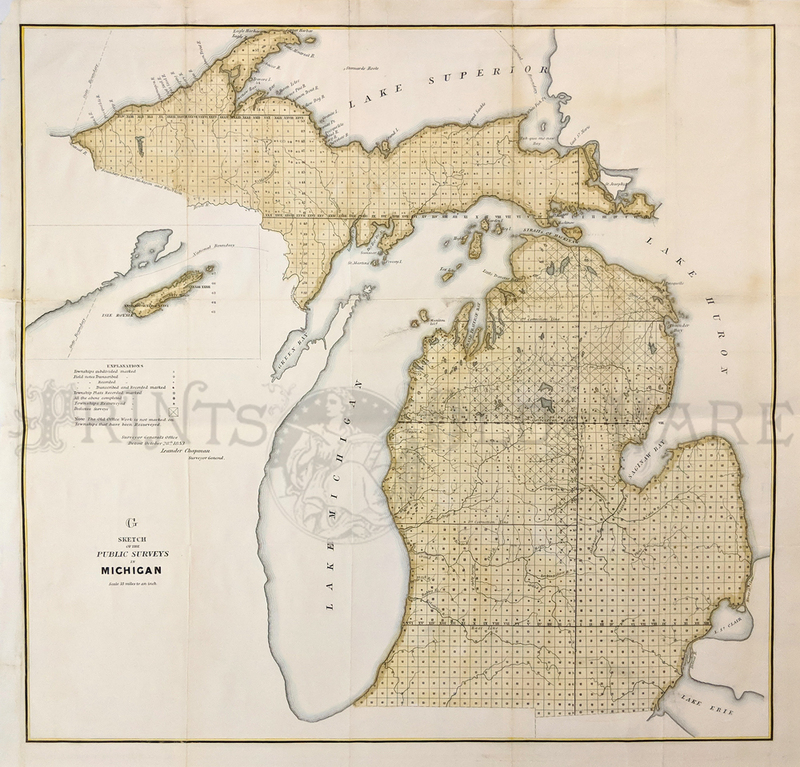 Color map of Michigan from the World Atlas and Gazetteer. 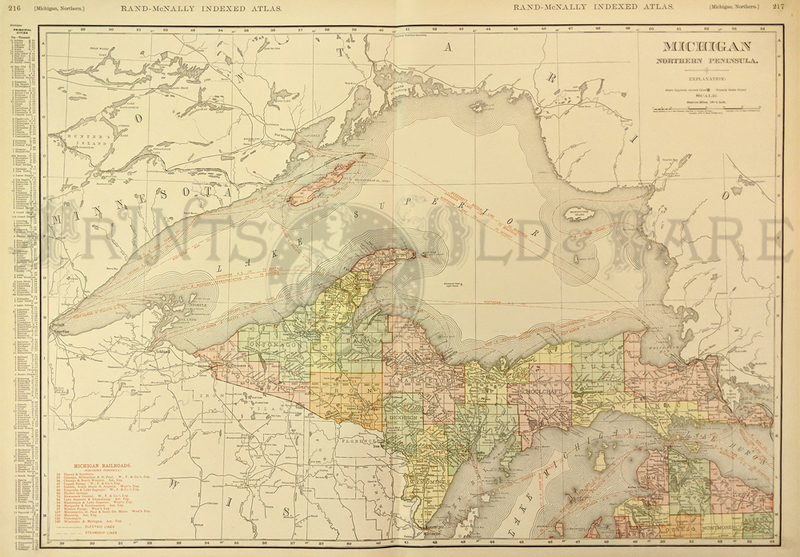 Color Rand-McNally Indexed Atlas showing the Northern Peninsula of Michigan and a guide to all the Michigan Railroads. 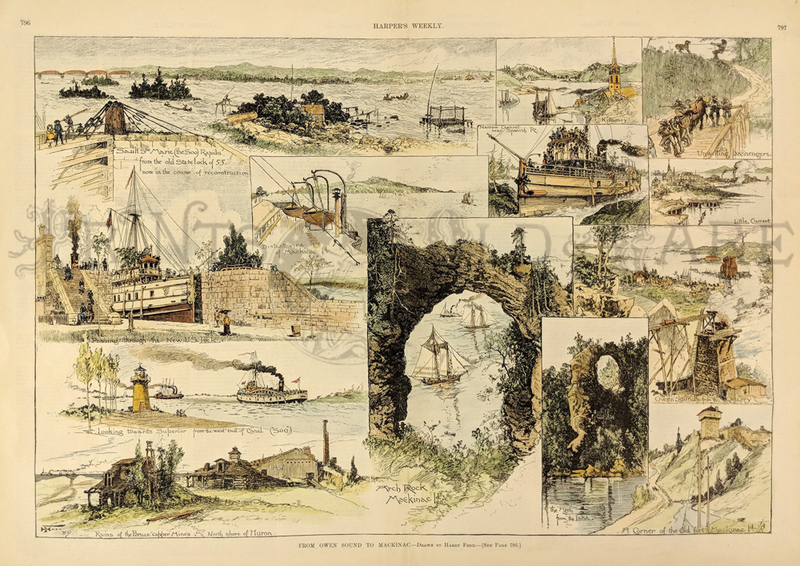 1853 Hand colored lithographed Sketch of the Public Surveys in Michigan which also shows the outskirts of Lake Superior. 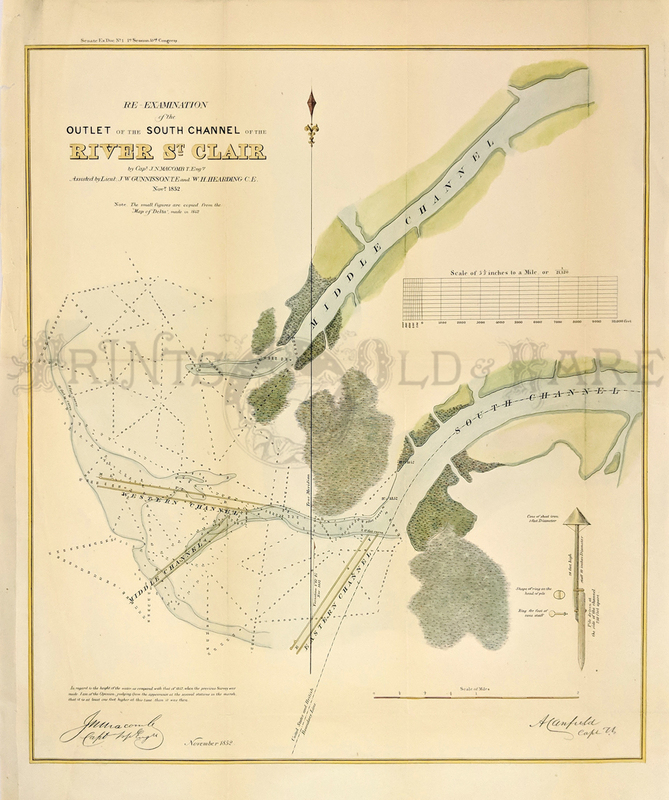 1852 Hand colored lithographed map showing the River of St. Clair Examination of the Outlet of the South Channel. 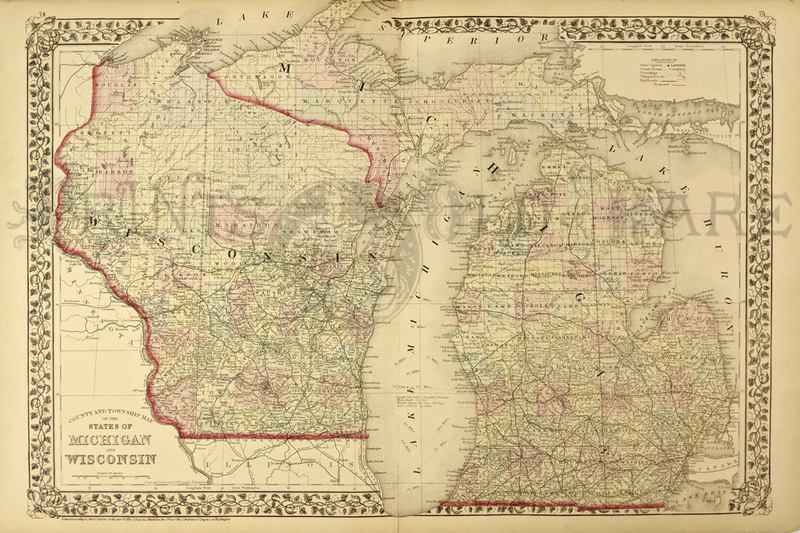 1863 Hand colored engraved Johnson's Michigan and Wisconsin map by Johnson and Ward. 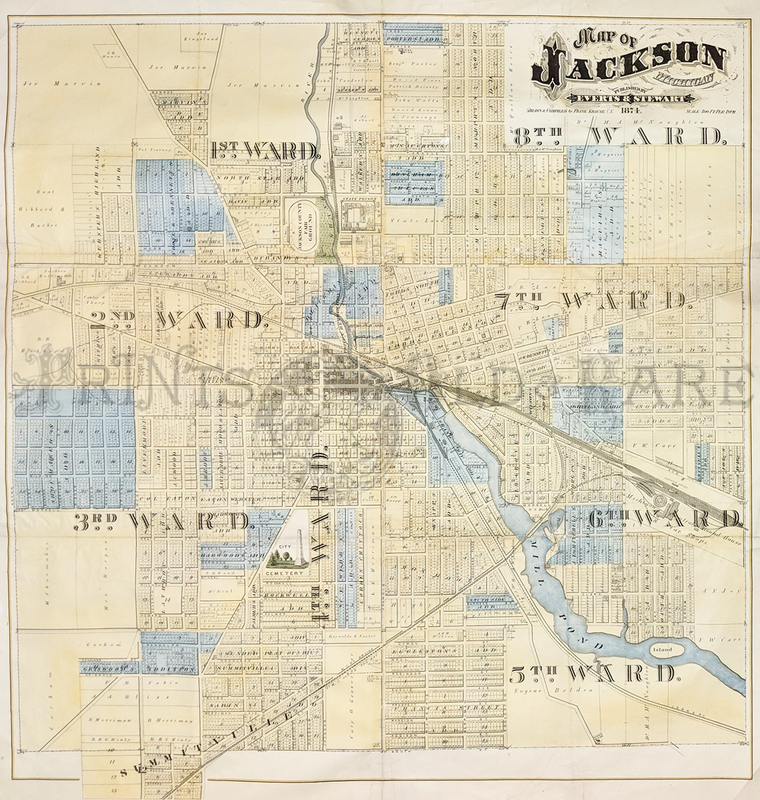 1874 Map of Jackson, Michigan published by Everts and Stewart, 1874. This color lithographed map is beautifully detailed map showing wards, streets, large land owners, locations, waterways and railroads. 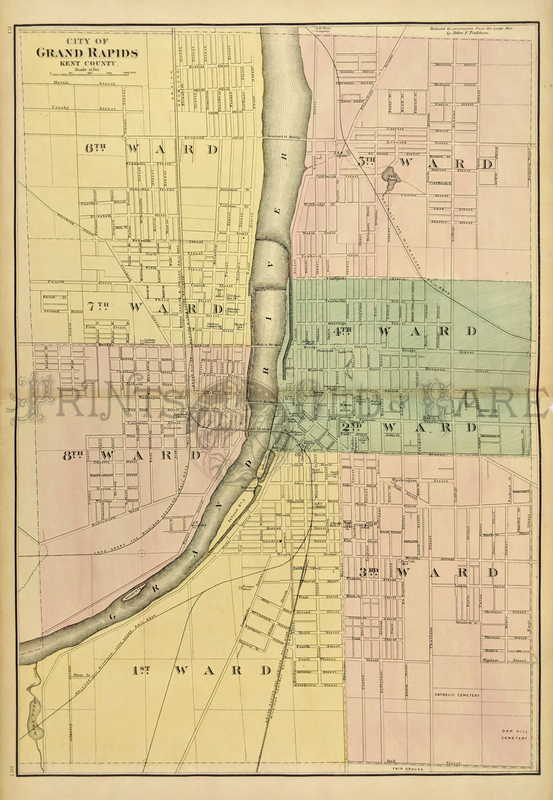 1873 Map of Grand Rapids Michigan. 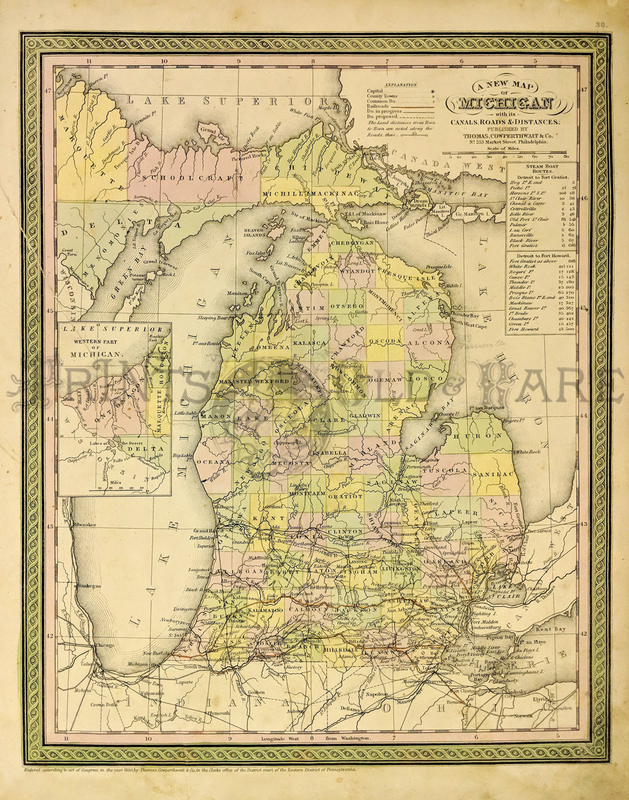 Large, hand colored map of the city of Grand Rapids, from an 1873 Michigan state atlas. Streets and bridges throughout the city are all named. 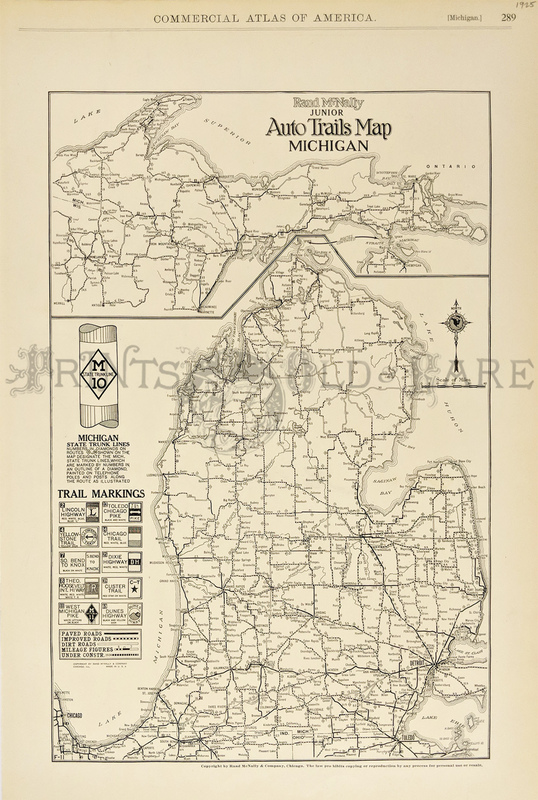 Railroad lines are shown, as well as the locations of churches and public buildings. Each ward within the city is separately colored. 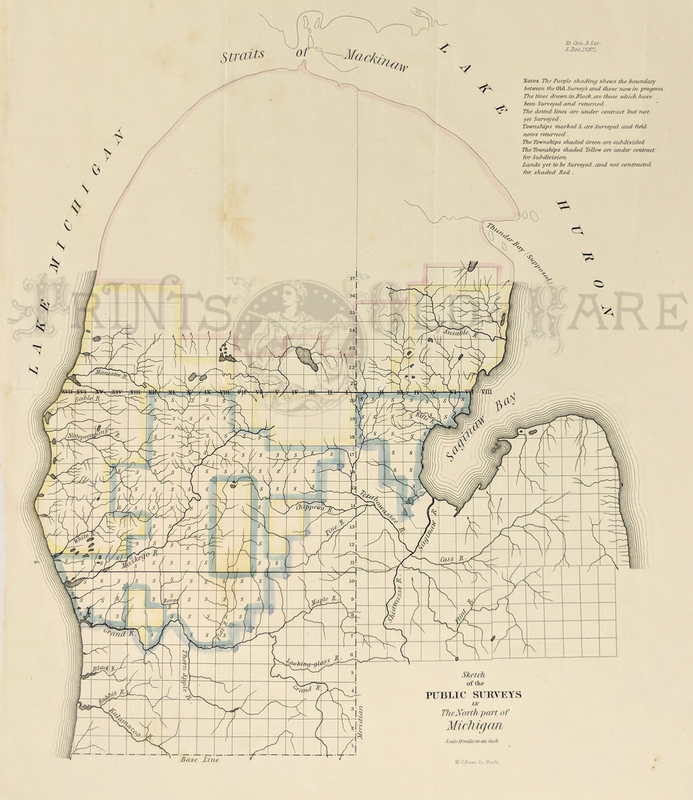 1850 Cowperthwait A New Map of Michigan with its Canals, Roads and Distances. 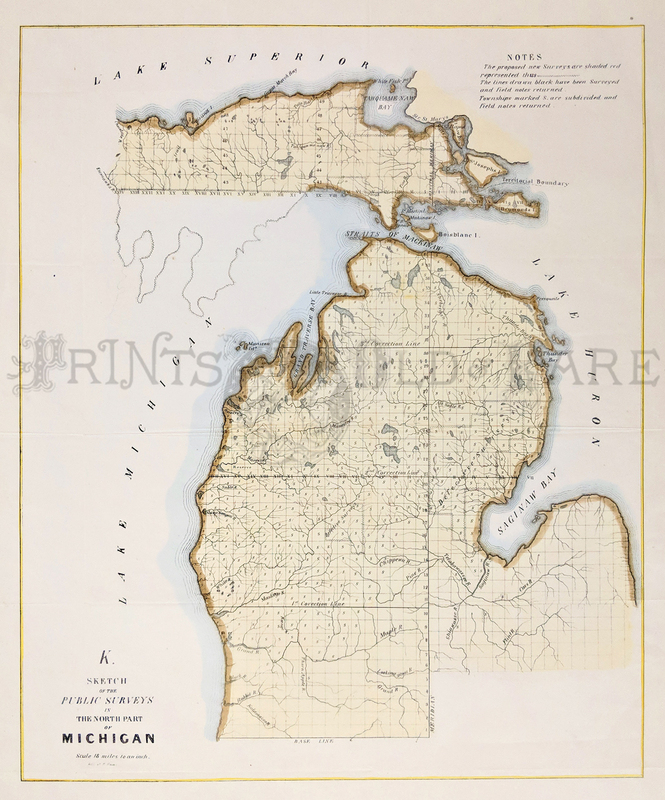 Inset in left shows the Western Part of Michigan. 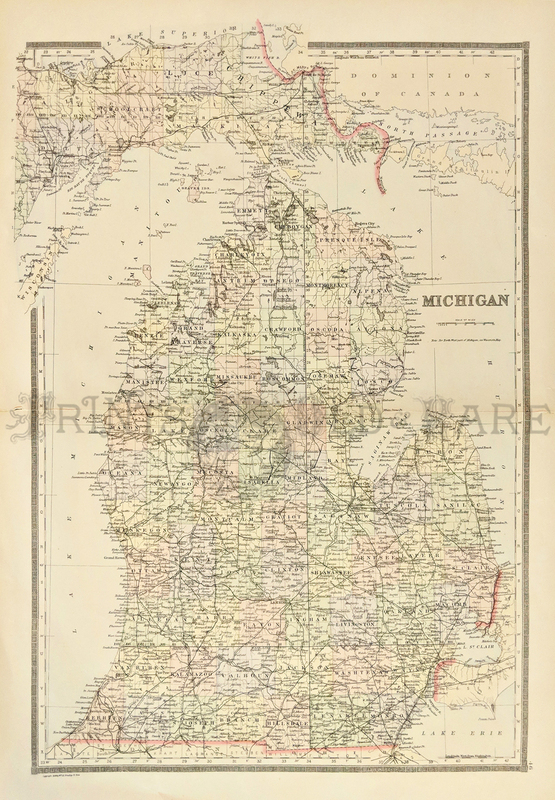 1898 Rand, McNally & Co.'s Southern Portion of Michigan showing all the railroads in red of that era on the Southern Peninsula. 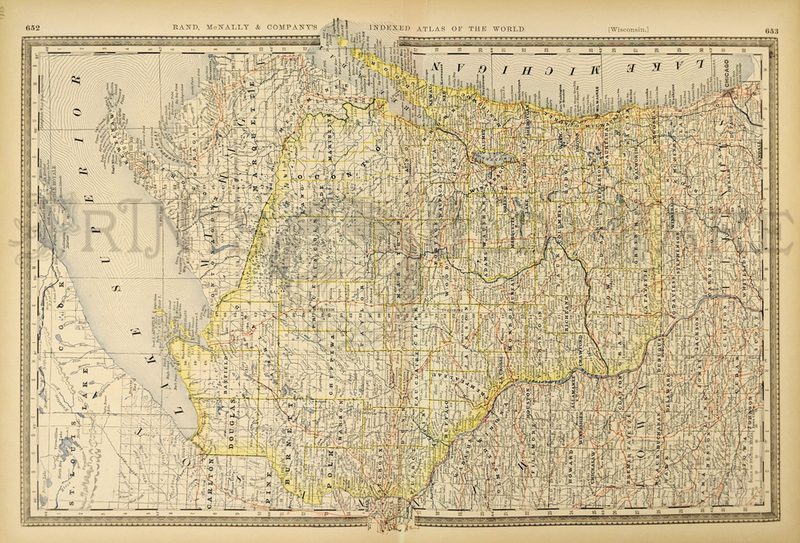 Counties are also shown and the cities within them. 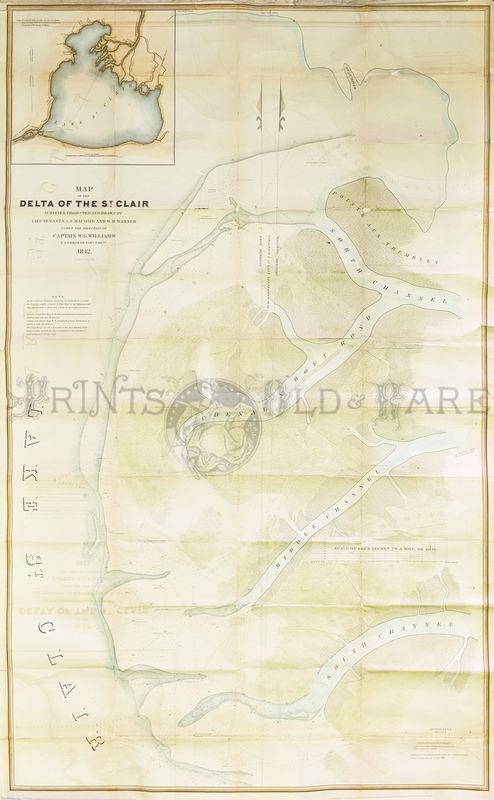 Delta of the St. Clair, 1842. Surveyed by Lts. Macomb & Warner under the direction of Captain W.G. Williams. This shows channels from the St. Clair River to Lake St. Clair. 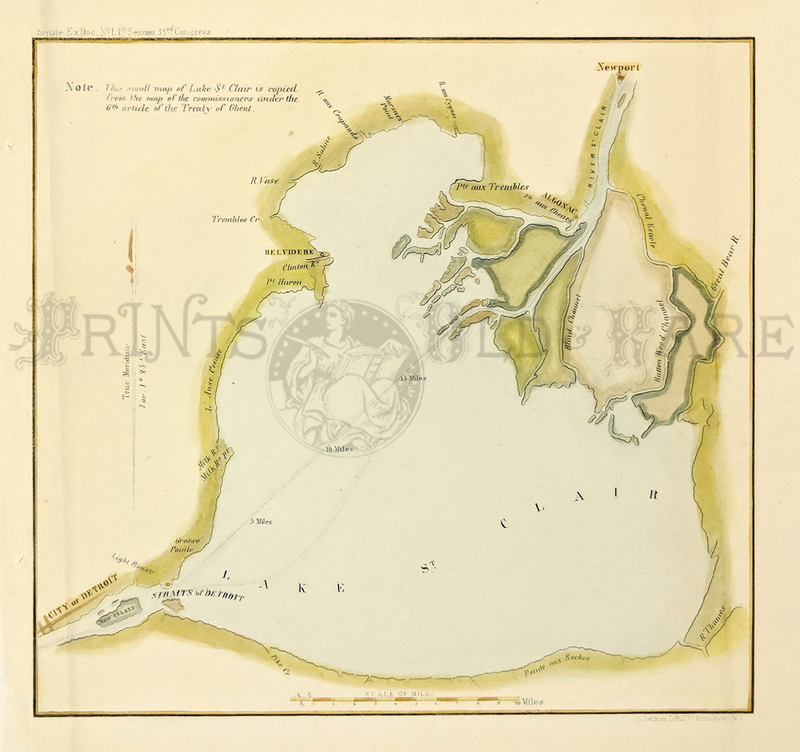 Inset showing whole of Lake St. Clair. Very rare. Hand tinted, some off setting. Overall very good condition. 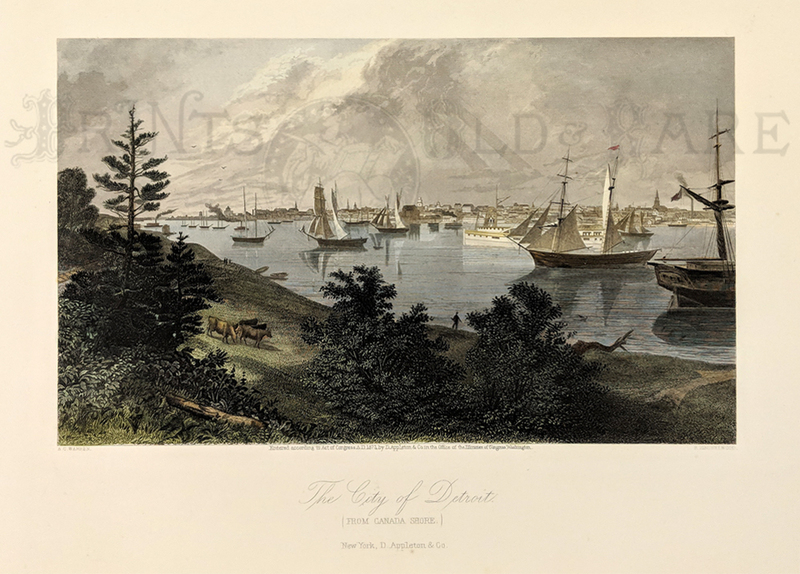 1842 Lake St. Clair hand colored lithographic overview showing Detroit, Hog Island, Grosse Pointe, Belvidere, Algonac and Newport. 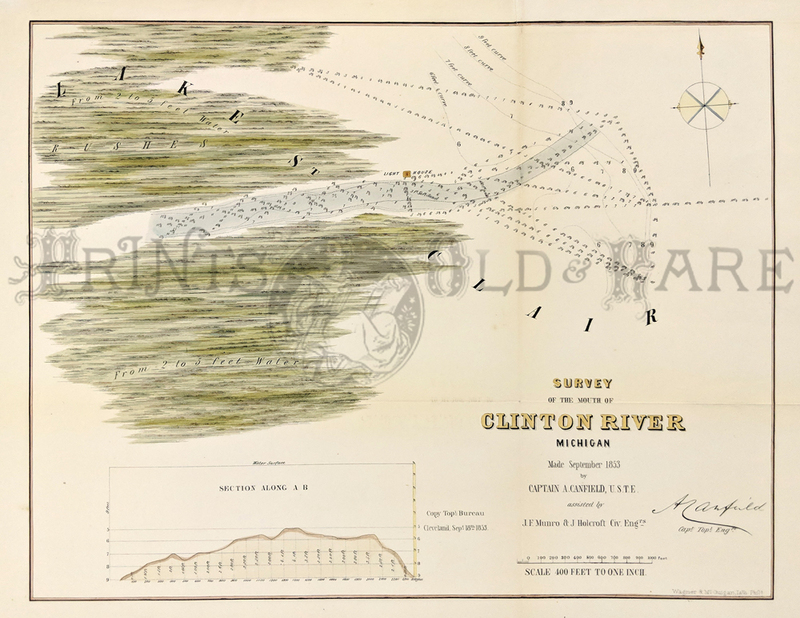 1853 Clinton River - Hand colored lithographic Survey of the Mouth of Clinton River, Michigan. 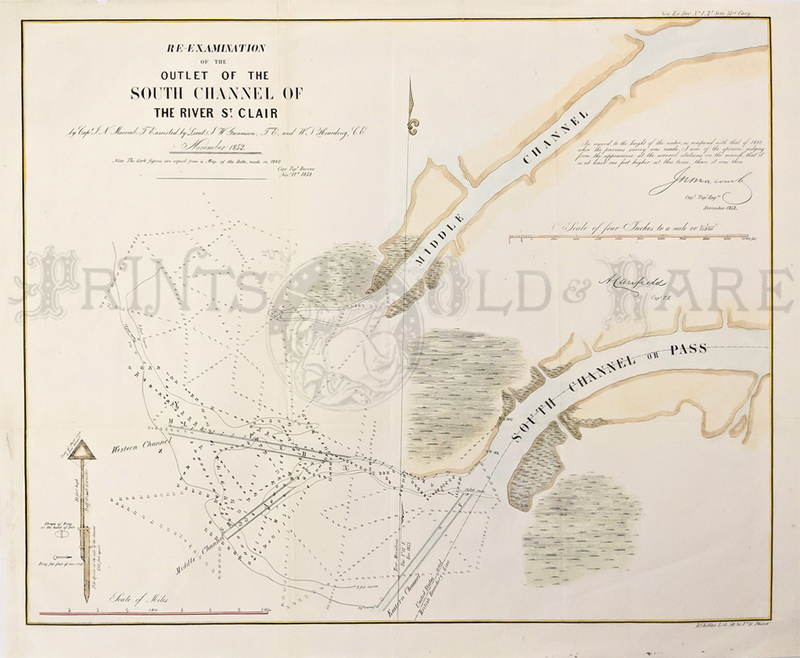 1852 "Re-Examination of the Outlet of the South Channel Of The River St. Clair," by Captain A. Canfield in this hand colored lithographed map. 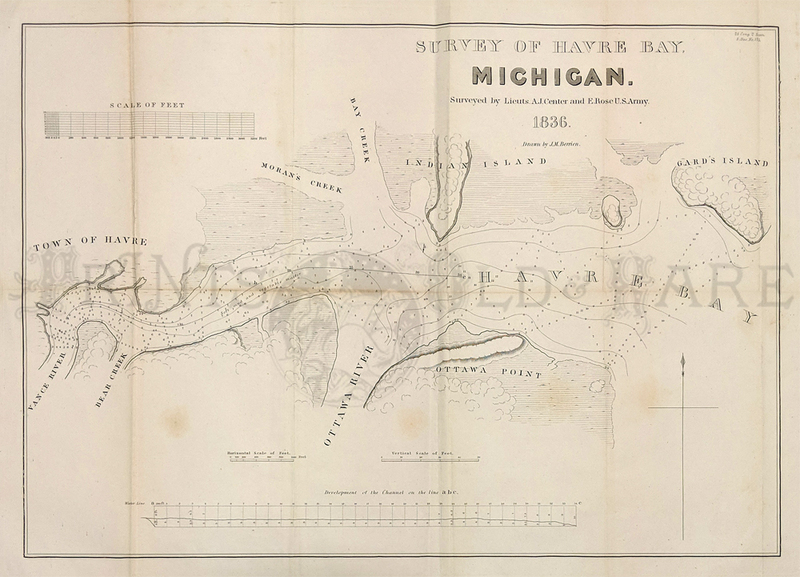 C.1840 Very early Pre-Civil War Survey Map of the North Part of Michigan. Note that survey has only started in the new Territory. 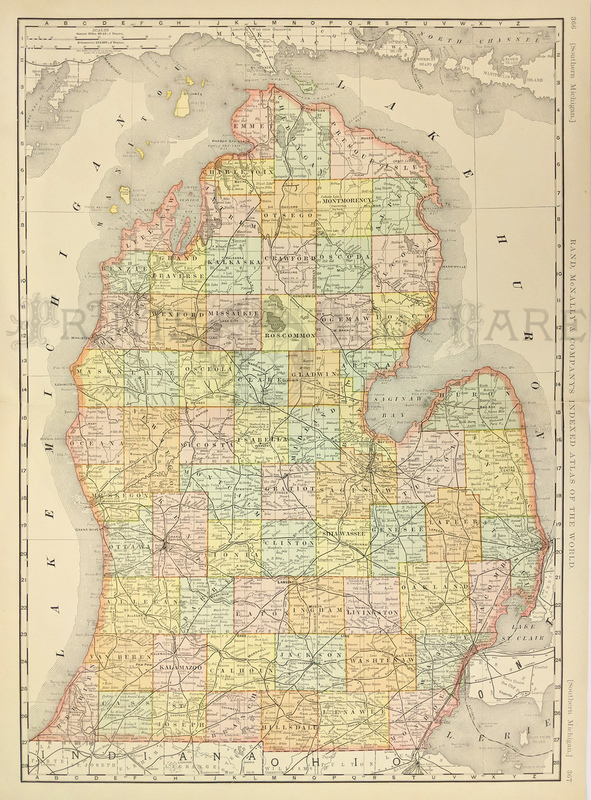 1889 Bradley's color map of Michigan which shows all the pertinent geographical areas, counties, and part of Canada. 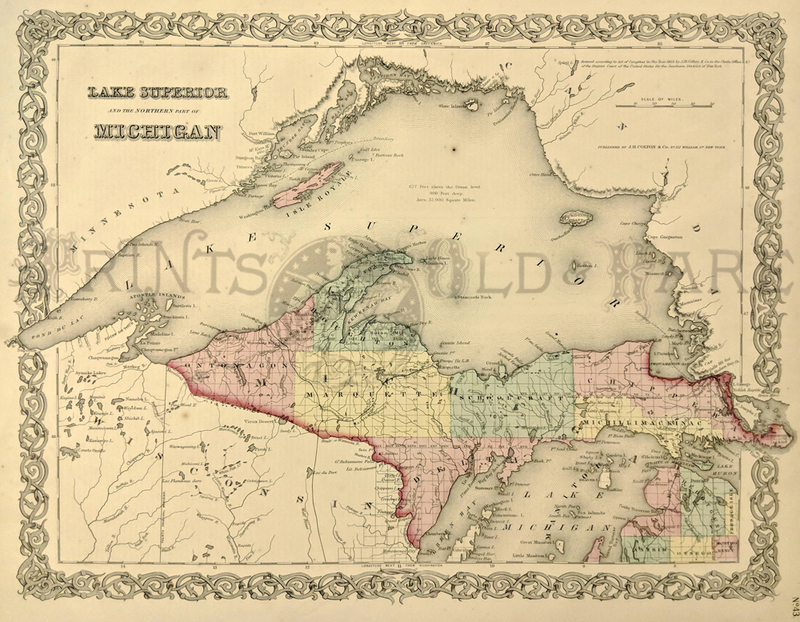 1857 Michigan by Colton. Hand colored engraving. Fine condition. 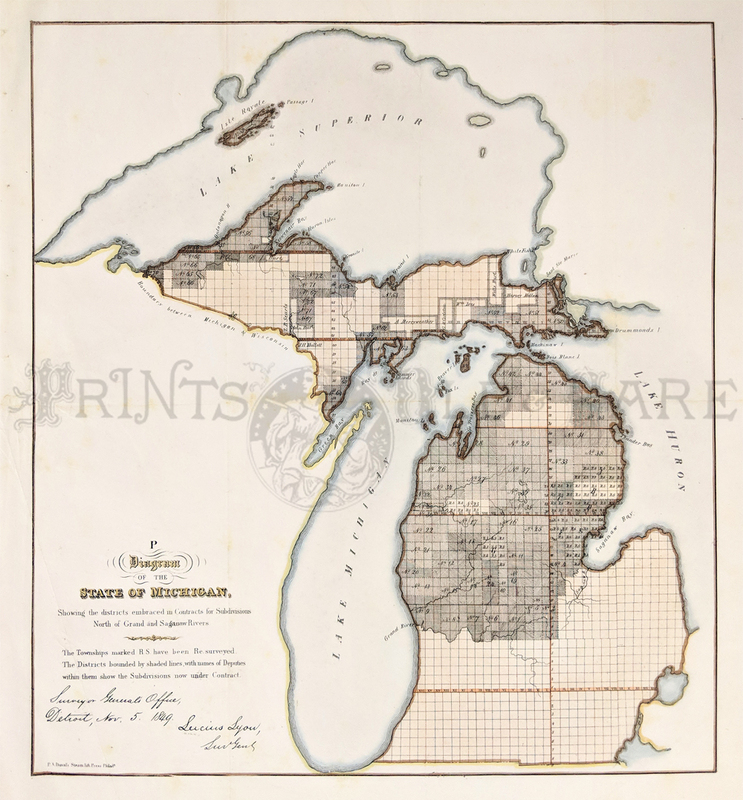 Rare 1810 Plan of Private Claims in Michigan Territory as Surveyed by Aaron Greeley D. Surveyor, in 1810. 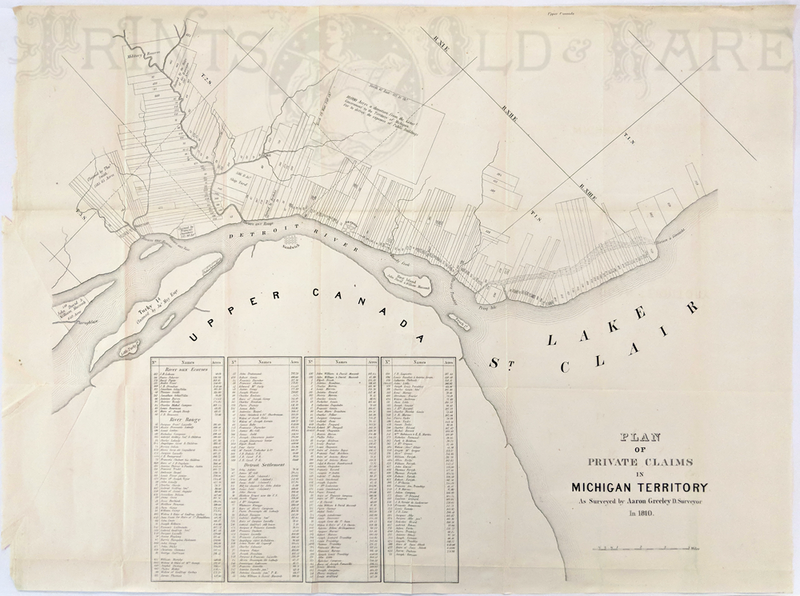 Shown on map are four Tables with the Claimant's names and locations of Acreage in Detroit. 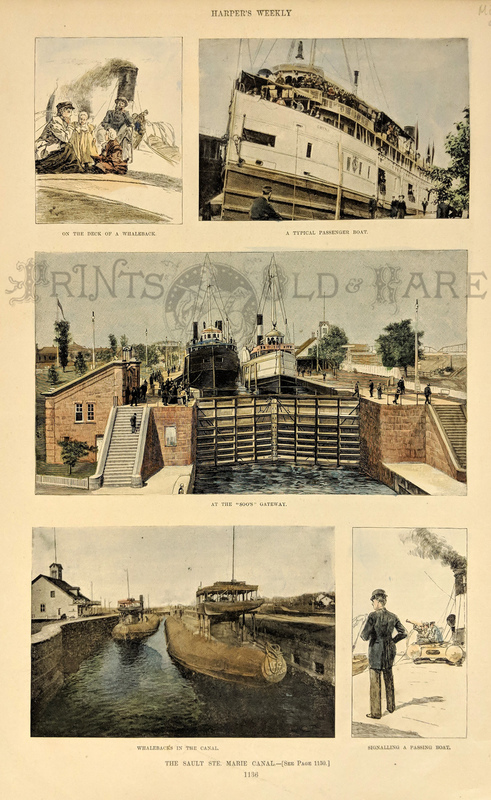 Ecorse Settlement (River and Ecorses) and River Rouge. 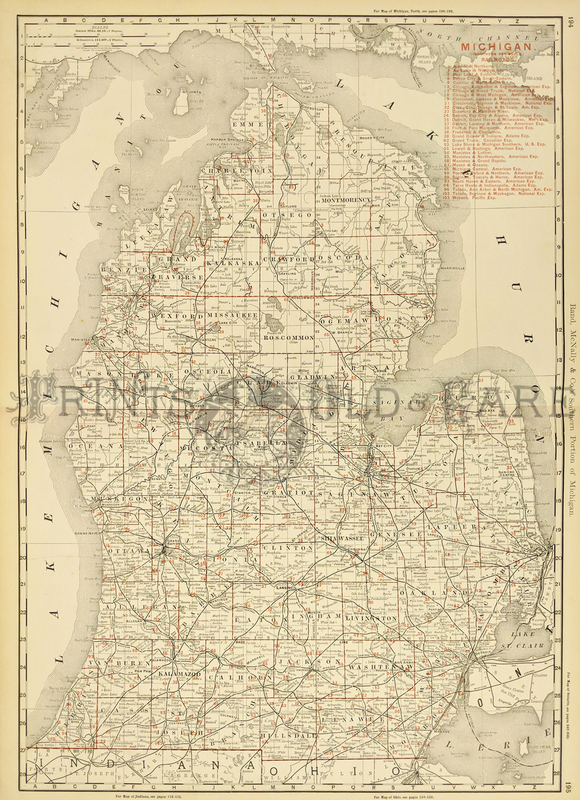 Shows ribbon farms along the Detroit River as well as the spoke layout of Detroit, Belle Isle, Turkey Island and Hog Island. Excellent condition.